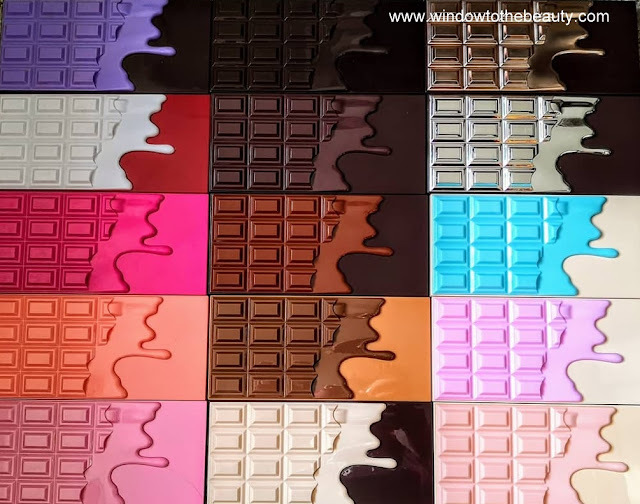 I heart makeup is one of the brands belonging to the Revolution, which is mainly known from the chocolates palettes which currently have up to over 20 various shades range. Some time ago they extended their offer also with bath products and colored hair styling paste. In the February Makeup Releases, I showed you the latest bath bombs about the appearance of a donut and I liked them so much that I decided to add them to the basket. In Superdrug they just restock Revolution Foil Frenzy, so I wanted to place an order anyway. They are available in Blueberry, Banana, Raspberry, Strawberry, Blackcurrent or Chocolate fragrance variants, I bought two because they just had an offer of second one half the price, so why not. So far, I've always used bath soak or salt so this is my first contact with the bath fizzers. When we throw them into the warm water, they start to dissolve and crackle, it really reminds me of the effect when we throw aspirin or effervescent tablets with magnesium or other supplements into the water. After a while, the whole bathroom is filled with a pleasant smell depending on which variant we choose. I was disappointed that the blue one didn't change the color of the water in the tub, only after the yellow I saw the difference and there was not much foam. Generally, they don't have any moisturizing properties, etc. just a moment of fun and a nice smell. According to me, this is a nice idea for a gift or an addition to a gift but not for your own use because it is not very economical. One such bomb costs £3 and it's enough just for one use, if we strongly stubborn for two, but it is still not profitable compared to other options. Generally nice gadgets that makes you joy but for everyday useing I will stay with oil or bath soaks. Do you like such a bath pleasing things?